One of my favourite things to do is to lunch. And back 15 years ago Perth had a number of amazing Italian families as torchbearers for fine Italian food [ and good wholesome foods ] There was the Silver Dollar in Aberdeen, Simons for Seafood in Lake and Muma Marias. The doyen was Harry Ferrante… and his show piece was Harrys Bar and Grill. Oh how I miss that scene. Great food, good fine and fantastic people. A friend from my first days in Perth was the Sunday Times food writer and now writes for the PerthNow website. Gail Williams is considered a great judge of what is good in the food and hospitality scene in Perth. 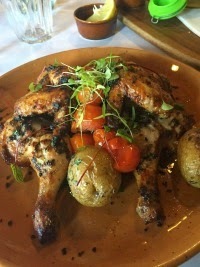 I heard Gail on Peter Bell’s afternoon 6PR Radio show giving a review of the Three Coins Italian Trattoria. She was scathing about the service BUT said the food was so good that it made up for it. So, I thought I should try the Three Coins for lunch… it sits at 776 Beaufort Street Mount Lawley, and is close by to where I work so it was with anticipation of a fine Italian meal that I visited recently. Well I was underwhelmed. The actual restaurant presented well but it was all downhill from there. I ordered spatchcock and was immediately told the wait would be 30 to 40 minutes because “everything was cooked individually” as if that was an acceptable reason to make lunch in an hour a near impossibility. Prices by Perth standards were reasonable but portions sizes were small. My dinner guest had gnocchi in a serving that would better suit a 7 year old… and the bill was close to $100 when a glass of red and a sparkling mineral water were added in. So, I won’t be back anytime soon, and I long for those long gone days of Harry Ferrante and his band of many, and their passion and commitment to making food and service a pleasure. Where are you Harry.